Applied Quantum Technology (AQT), a developer of low-cost CIGS thin-film solar cells, has recently announced key partnerships with solar companies including Intevac, Solar Enertech and HelioPower. AQT’s business model is leverage based and depends on strategic partners in order to address the three critical success factors required by the new PV market realities: scalability, aggressive cost reduction and continuous technical advancement. AQT’s CEO Dr. Michael Bartholomeusz introduces the company’s innovative approach to CIGS technology, dubbed CIGS 2.0. AQT manufactures CIGS solar cells. Why has AQT chosen to enter the PV Market? And why CIGS? AQT was founded on the basis that the technologies and resources of parallel high-volume high-tech industries could be very favorably leveraged for PV manufacturing. The CIGS system was chosen because of its demonstrated high efficiency and low cost potential. Could you introduce your innovative CIGS 2.0 approach? AQTs innovative CIGS 2.0 approach leverages the manufacturing infrastructure and platforms that have been field-proven in parallel hi-tech industries. This approach will enable AQT to cost-effecti-vely produce thin-film solar cells that will be drop-in replacements for conventional crystalline silicon cells. AQT has recently announced partnership agreements with Solar Enertech and HelioPower. Could you tell us more about the partnerships? What kind of benefits will they bring to the solar industry? Solar Enertech is working closely with AQT as a module manufacturing partner and will assist with product certification and qualification. HelioPower will assist with initial customer installations and provide a smooth market entry for AQT’s products. Both partnerships illustrate the leverage-based approach adopted by AQT. By working with proven partners such as these, AQT anticipates accelerated market entry and also a credible pathway to establishing bankability. CIGS is a material that a number of companies are betting on. What is unique about AQT’s manufacturing tools for CIGS? The tools that AQT plans to use are highly automated and modular. This permits capacity expansion in manageable increments using a copy-smart process. It also results in smaller capex increments for capacity expansion. You’re announced a comprehensive deal with Intevac, a hard disc manufacturer, in April. What can we expect from this partnership? Working with a proven manufacturing partner such as Intevac has allowed AQT to focus on the process of creating cells rather than on creating an entirely new custom production system. We also leverage a vast reservoir of accumulated experience and expertise from the HDD industry. What’s the cost of producing electricity from your CIGS thin-film solar cells? The final numbers will be known only when we actually have some product installations but we believe that our costs will be competitive with other solar cell technologies. What’s your efficiency goal this year? While we believe that efficiency is very important our more immediate goals are to demonstrate high yields and uniformity and a rational cost basis. These have been the major challenges for the CIGS industry. What is your prediction for the thin-film industry this year? Led by First Solar, we believe that thin-film PV will continue to grow and make inroads into the global PV market. CIGS will finally be a representative product category. What are some of the major challenges for AQT going forward? 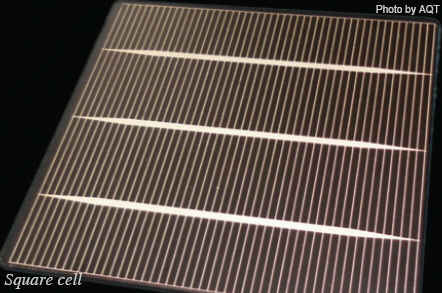 The critical success factors for anyone in the PV space is going to be scalability, continuous cost reduction and continuous technical advancement. All of these pose multiple challenges around which we have devised our business strategy. Jeanny Lim is Editor-in-Chief of InterPV. Send your comments to swied@infothe.com.